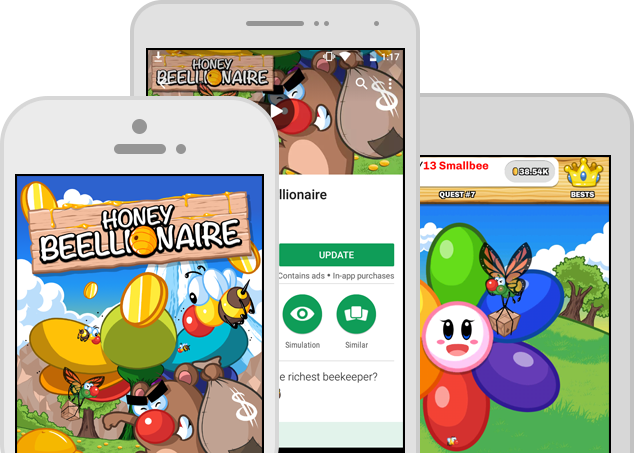 Honey Beellionaire is an incremental clicker game where you plan to become the richest beekeeper of them all... Or shall we say, a BEELLIONAIRE! Try it now for Free! Check out all our games and apps! We are fans of free things, so all our apps are available for download for Android and for iOS for FREE! It includes a wide range of apps - with real-time photo manipulation, music and audio volume change, and games for killing time while waiting in lines. Our games and apps are mobile software designed for running on the Android and iOS operating systems, which are one of the most popular platforms used in smartphones, tablets and other mobile devices. To get the maximum benefit from our apps it is important for you to be able to contact us if you have any questions. Feel free to get in touch with us by e-mailing at anytime. Submit your high score to the online charts and show your friends or foes who's the real Game Master. We are established, respected developers who are committed to launching high-quality and innovative apps. This means that our apps are among the best and most trustworthy apps. We are constantly improving our apps by adding more content and features to meet all your needs and wishes. We planning to offer our apps on other devices and platforms as well.